Thousands of tourists flock to Rorke’s Drift every year inspired by the classic 1960s film Zulu which has made this one of the most famous battles in British history, but it is difficult not to feel a little underwhelmed when you first arrive. Two unremarkable corrugated roofed buildings, a small church and a storehouse, make up the mission station making Rorke’s Drift looks more like a village bowling club than the scene of a vicious battle between 140 British soldiers and 4,000 Zulus. It requires the story telling skills of our guide Andrew Rattray to bring that scene from 136 years ago to life. 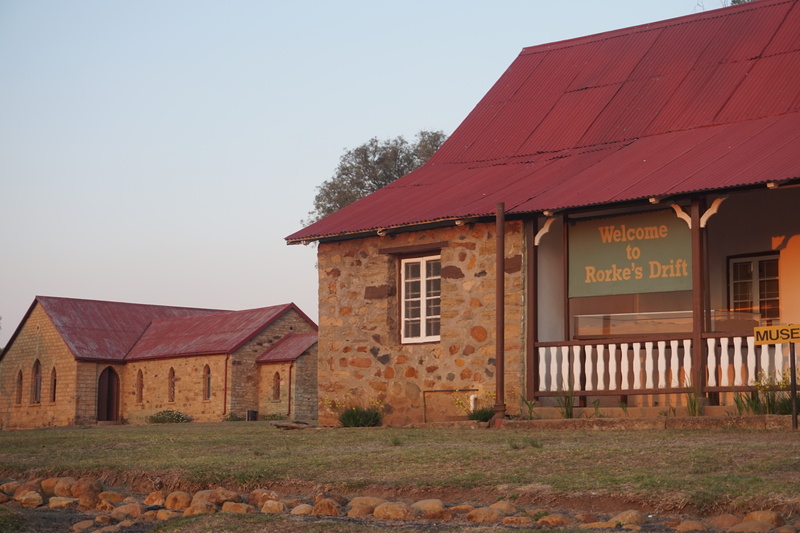 The name Rorke’s Drift has two origins. The settlement was established by Irish trader James Rorke in the mid 19th century. The buildings were sited close to the Buffalo River, the boundary between the British colony of Natal and Zululand with the purpose of trading with the inhabitants of both. The other part of its name comes from its location 1,000 yards from a natural causeway in the river allowing people to cross, known locally as a drift. Rorke, an alcoholic and by all accounts an unstable man, committed suicide in the 1875 when his female servants failed to bring back his favourite Square face gin from a trip to a Ladysmith. At this point it was taken over by the Swedish missionary society and missionary Otto Witt arrived, turning the trading station into a mission station for converting the Zulus to Christianity. It was at this mission station that the British army arrived in January 1879 on its way to invading the Zulu kingdom. Nothing was expected to happen at Rorke’s Drift and Lord Chelmsford, the British commander, commandeered it and decided to turn it into a hospital for his sick men and the warehouse, now a church, into supply depot for the main force which was to force triumphantly into Zululand, chasing the warriors of King Cetshwayo back to the capital of Ulundi, and there corner and defeat them. No battle was expected to be fought here. Hence it was defended by a small force of British soldiers, B company of the 24th regiment, about 140 men. Another 300 locally recruited Black soldiers, part of the Natal Native Contingent (NNC) were also stationed there. They were very poorly equipped by the British. The company was commanded by Lieutenant Gonville Bromhead. Also at the drift station was Lieutenant John Chard of the Royal Engineers, tasked with building a bridge over the Buffalo River – both men would earn Victoria Crosses for their actions at the battle but both were also be criticised by the British commanded Lord Wolseley as incompetent and stupid men, and that he had never met “more uninspired officers” an accusation our guide thought was a very unfair assessment. When much of the rest of their regiment was slaughtered on 22 January at Isandlwana just a few miles away in Zululand, the men left at Rorke’s Drift faced a terrible choice. Knowing from an alarming letter from survivors that the Zulus were on the way towards them they could either flee back to the nearest British base at Helpmakaar and risk being tracked down and killed, or stand and fight in the hope of reinforcements arriving to save the day. For their part the Zulus under Prince Dabulamanzi kaMpande shouldn’t have been in Natal at all. In a piece of early public relations King Cetshwayo had ordered his soldiers not to attack the British colonies in order that they would be seen as the victims of British imperial aggression. But his brother kaMpande was impetuous, neither the prince nor the soldiers under his command had been involved in the victory at Isandlhwana and could not reflect in its glory. So 4,000 Zulu warriors forded the Buffalo River, confident of a quick and easy victory over the British at Rorke’s Drift and giving them an opportunity to ‘wash their spears’ in the blood of their victims as was Zulu tradition. By seniority Chard was de facto in charge of the garrison at Rorke’s Drift, but it was the commissary officer in charge of the supplies, James Langley Dalton who made the decision to stand and fight and prepare the place for defence, for this Andre believes Dalton deserves more credit than he has received. The men used what came to hand. Mealie bags, pull of Indian maize and heavy wooden biscuit boxes were stacked on top of each other to create walls, these walls stretch the 40 yards on both sides of the two buildings, creating a rectangle. Inside another wall of biscuit boxes was built at an angle across the two larger walls as a second line of defence. Finally a small ring of mealie bags was erected inside this smaller square, this was to be the location for a final stand by the defenders. 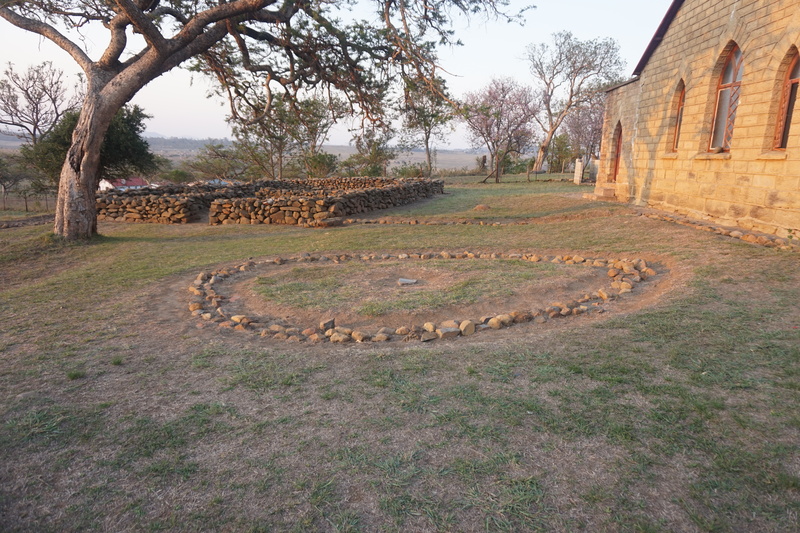 Helpfully, a line of stones has been erected at Rorke’s Drift, giving the visitor an idea of how it looked. It is incredible how small this area is. The hospital was also made part of the defence. Many of the sick men, many of whom had fever, couldn’t be moved and it was decided to fit around them. Healthy soldiers volunteered to help defend the cubby hole rooms that made up the hospital. With no windows, the rooms were shrouded in darkness apart from a small loophole made in the wall for the soldiers to fire through. The Natal troops were spooked by news of the arrival of the Zulus and deserted, the Britsh enraged by this fired after them and killed several. Now it was 140 versus 4,000. At around 3.30pm the Zulu force, the left horn of the buffalo of the main Zulu army, arrived in sight of the drift, as Prince kaMpande trotted up on his white horse below the Oskarberg mountain overlooking the mission station, hundreds of his warriors charged en masse at the defences. A volley of lead met them and hundreds were killed or wounded. The Zulus were showing the same overconfidence as Chemlsford had in Zululand and were repulsed. The Zulus now crept around the mealie bag walls trying to find a weak spot while others fired down on the defenders from the Oskarberg. Eventually the Zulu warriors, who Andrew describes as astonishingly brave, break into the hospital and find to fight their way through, killing and disembowelling those they caught. At this point they also set fire to the roof which was hatch. At about the same time the British defending the mealie bags were forced back by a Zulu attack to the second line of defence, leaving a no man’s land between them and the hospital which was being surrounded. It is this point in the battle that the museum at Rorke’s Drift specialises in, located in Witt’s house. It chronicles, the defence of each room which did not have doors. As the defenders were pushed back a private John Williams would use a broken pickaxe to hack through one after another and escape with wounded and sick soldiers, behind them private Hook, would hold off the Zulus at bayonet point. Hook was wounded by a spear thrust to the head, leaving a scar for the rest of his life, he won the Victoria Crosses but was portrayed as a drunk and a malinger in the film Zulu, Andrew our guide explains he was in fact he was a teetotaller. Hook helped to drag the patients of the hospital to an exit but found it several feet from the ground, it took a couple of brave volunteers to brave the bullets and spears to rush from the biscuit box line to the hospital to help evacuate it. Among them was a man named Hitch who helped despite being badly wounded, he would receive a VC. Most of the patients were saved. 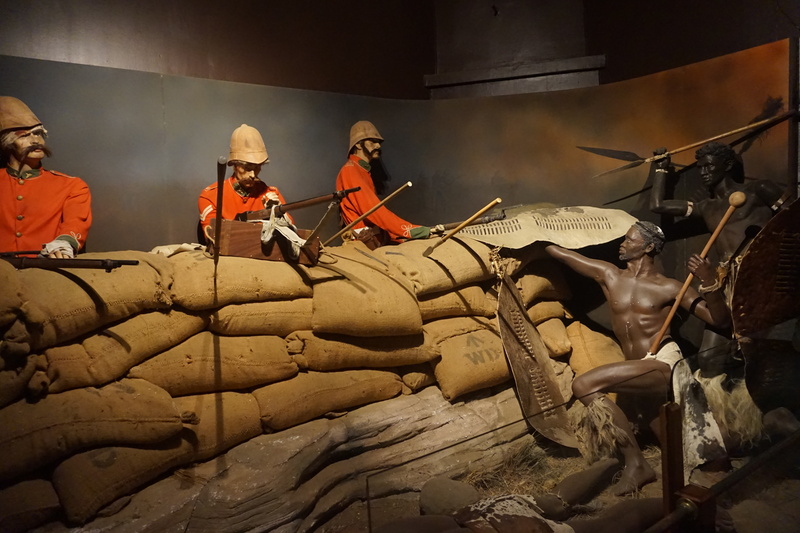 Perhaps the highlight of the museum is the frightened looking manikin in a wardrobe, it depicts Private Beckett who hid during the battle and despite the Zulus running through the hospital and the fire raging above, managed to survive and escape outside. Its impossible to mention all of the personal stories at the battle but Andrew mentions a few. The priest George Smith, a large man who wouldn’t fight for his religious beliefs but did hand out bullets to the troops, thus earning the title Ammunition Smith. Reynolds the surgeon who battled to save lives of the wounded and even Pip the dog who yapped at Zulus who approached in the darkness. Once the hospital had burned down the Zulus continued to attack the defenders now in pitch darkness. Andrew estimates that the British fired 20,000 bullets during the night. In the morning the exhausted defenders, down to a few bullets, expected to be overwhelmed if the Zulu attacked again, but this didn’t happen. The warriors, expecting an easy fight were demoralised by the losses they had suffered and decided to withdraw back into Zululand. 17 British soldiers had died and others wounded, estimated of Zulu dead vary but were thought to have been almost 900 dead and untold numbers injured. It was a great victory that helped to win back British honour after their earlier defeat but as Andrew explains this was not recognised as such at the time. It took more than a year for some to receive the credit they deserved, such as Dalton who had to wait for his Victoria Cross to be awarded. But as Andrew explained, this was not a story just bravery and medals, like all wars it was a terrible waste of human life. Those who survived were traumatised by what they had seen, some of those who won Victoria Crosses were quickly forgotten, Hook would become a janitor at the British Museum, another, falling on hard times and becoming a farm hand, committed suicide. Another would have a break down in later life and was found running the streets of London with his grandchildren under his arm crying out that the Zulus were chasing him, shortly afterwards he was declared insane and committed to a workhouse. The impression the visitor is left with is that much bravery was displayed by both sides at Rorke’s Drift and this should not be seen merely as a great sword rattling British victory – the Zulus displayed almost insane bravery in attacking men with repeating rifles armed only with spears. But it is hard not to be impressed by how a small group of soldiers held them at bay and helped each other to survive that day.